This Slow Cooker Hawaiian Pork Chops recipe is both a time-saver, with just 20 minutes of prep, and a delicious way to work pork chops and Asian-inspired fare into your regular dinner routine. 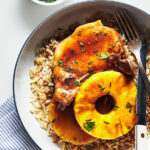 Don’t be fooled by the simplicity of its preparation: The garlic, rice vinegar, and soy sauce trio up the umami factor big-time, creating a slightly sweet, rich, savory glaze for these Hawaiian-style pork chops to steep in. A little fresh cilantro serves as both a garnish and a bright finishing note to these tasty chops. 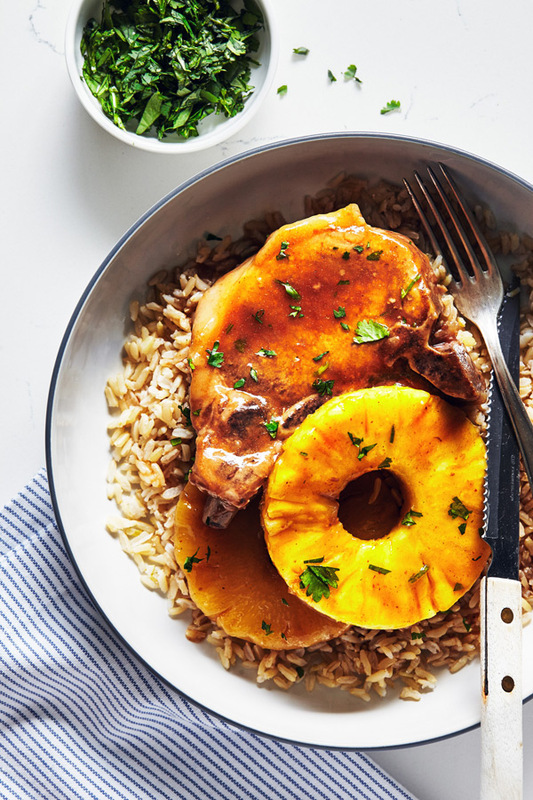 These Asian-inspired Hawaiian pork chops are with pineapple and steeped in a slightly sweet and boldly savory glaze you'll love! Combine water and cornstarch in a small bowl; whisk to blend. Set aside. Combine soy sauce, honey, ketchup, pineapple juice, vinegar, and garlic in a medium bowl; whisk to blend. Add cornstarch mixture to soy sauce mixture; whisk to blend. Set aside. Lightly coat inside of a 3-quart slow cooker with spray. Add half of soy sauce mixture, pork chops, pineapple, and remaining soy sauce mixture; cover. Cook on high for 3 to 3½ hours (or low for 5 to 6 hours), or until pork chops are tender and cooked through. Serve each pork chop with ½ cup rice. Evenly divide sauce and pineapple between pork chops. Sprinkle each with 1 tsp. cilantro. You can substitute 1½ cups sliced fresh pineapple for canned. Use ½ cup of unsweetened pineapple juice for liquid. Add a side salad or veggies to make this a great lunch option.